There are a thousand more islands in the Philippines (about 7,641 isles) that I’ve yet to visit and explore. And it's packed with natural treasures worth discovering like Mariveles for example - a picturesque seaside town in Bataan. 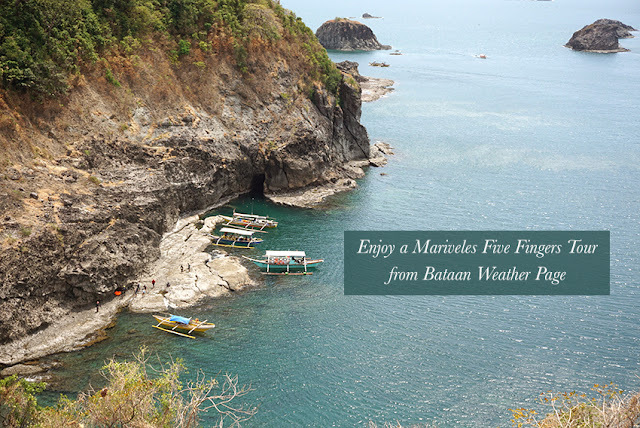 Situated at the southern tip of Bataan (50 km west of Metro Manila), Mariveles is famous for its much-admired Five Fingers – a series of coves to the west of the municipality, which looks like a hand spread out when you view the map. Before proceeding to our tour, we first registered our details, signed individual waivers, and were oriented by the Bataan Weather Page team – a group led by Mr. Rustan Jalos Padua - a former Safety Engineer who founded Mariveles’ five rock structures. NOTE: The jump-off point to Mariveles’ Five Fingers is called Porto del Sol. There was ongoing construction at the port when we visited in March. So there were only make-shift wood planks that transported the passengers from the docks to the boat. It would be best to manage your expectations when it comes to the docking area given its murky shoreline. Cochinos, which means Pig in Spanish (baboy in Tagalog), is the cove named after the first finger (thumb): Cochinos Point. Smelling a urine-like odor coming from the cave nearby and seeing the washed-up trash on the bottom of the hill (the cove becomes Manila and Cavite's catch basin during bad weather conditions) was a sad welcome. But it didn't end there, as rough terrains and a steep (daunting) climb greeted us. I was thankful for having worn the appropriate gear for this trip, as it saved me a ton of pains and aches later on. Traversing the first cove tested our strengths and limitations, as it required us to climb up on all fours due to the hills steep topography. By the time we got to the summit, which probably took around 25-30 minutes to reach (due to our pace), we were all drenched in sweat and covered in dirt. The ascent was hard on the knees because of the slippery and rocky path. Thankfully, the view from the top was beautiful, so it made up for all the daunting things we had to experience on our way up. From this vantage point, you will find the other fingers, the ‘Los Cochinos’ (piglets or the smaller islets), and Corregidor Island. NOTE: In my honest opinion, the hike wasn’t meant for beginners, as advised. In fact, it was quite hazardous to climb, as there were no safety gears provided. You wouldn’t wish to fall and tumble all the way down, as sharp rocks will likely catch you on the bottom. When you go on trips like this, make sure that your tour operator includes insurance. It’s better to be safe than sorry later on. If you’re an adrenaline junkie, then Natsu is your place. Natsu (meaning summer in Japanese) offers varied cliff heights where you can jump and dive (from 5 feet to 60 feet is the highest point). Natsu Lagoon, on the other hand, is perfect for rock climbing and snorkeling, too. It’s also the least extreme from the two options. 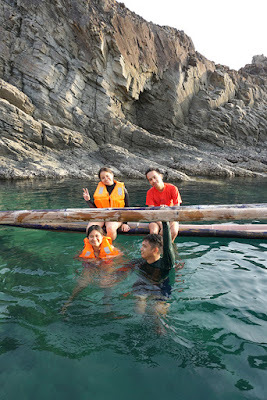 Hornos Point or Puntang Mahaba is one of the most popular destinations out of all the coves because of Nagmandala Rock. Its striking yet picturesque formation is what makes it a stylish backdrop for shoots like pre-nuptials. We no longer had the chance to drop-by Naiklec Point, as our group was already running late for lunch. But if you’re visiting this bay, our guide Yves recommends that you explore and see it for Mawakis Cove. We visited the 5th cove twice. The first one was before heading to lunch at Kaweder Campsite, and after eating. 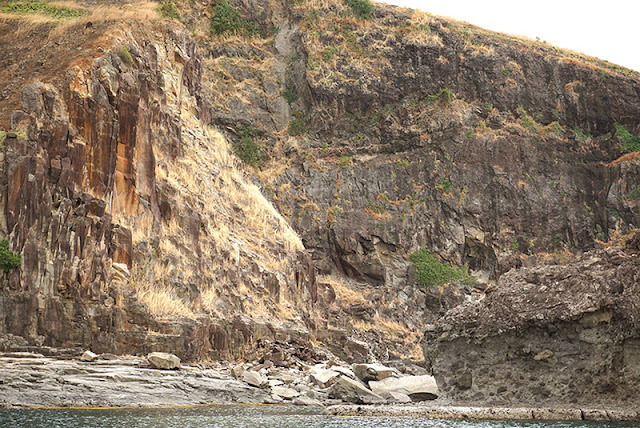 On our first stop, we stopped at Tinanlakan Lagoon, where a famous 40-foot cliff jump hosted a crowd of people. On our second stopover, we got down from our boat to explore Nagbintana Arc (ideal for snorkeling) and Latain Point – a rock formation that is said to resemble the throne from the TV series, Game of Thrones. NOTE: Should you go rock climbing or swimming (plenty of sea urchins were scattered underwater), please do it with utmost care. 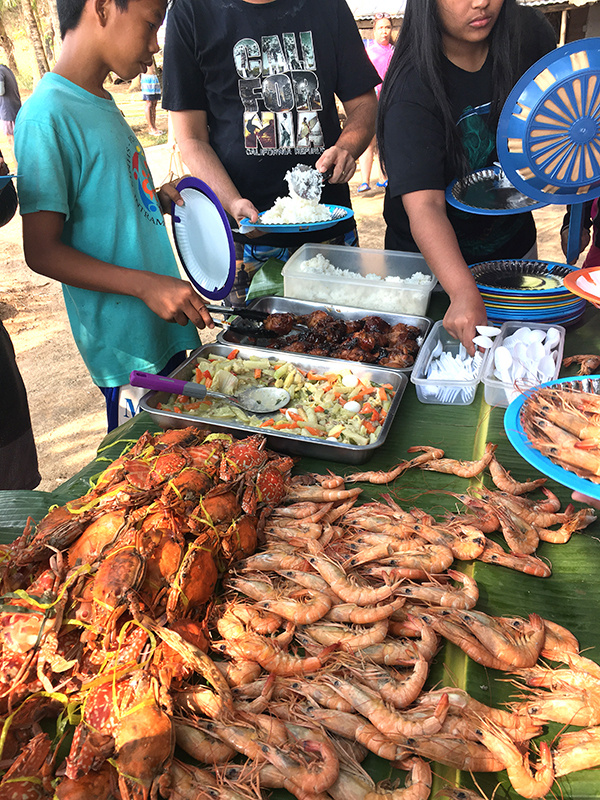 Aglaloma Bay is where every tour stop for lunch, specifically at Kaweder Campsite (you can stay here and camp by the beach). It is a beach camping site located at Aglaloma Beach. I particularly enjoyed this part of the tour, as our hosts made sure we ate plenty of seafood, meat, and veggies. I liked that my friends and I were able to eat as much, and that we felt equally pleased with the way the food was cooked and seasoned. I would also like to commend the locals who prepared the buffet. Each one of them were nice and accommodating, which made our short stay in Aglaloma all the more a wonderful experience. NOTE: There is no signal in this location. While I enjoyed this tour, there were still some changes that needed to be declared. For this specific tour operator, I would like to suggest that they provide two guides for every trip. My friends and I noticed the need to have two spotters per group (front and back), especially during our ascent and descent at Cochinos Point, for safety purposes. Also, I highly recommend that you wear protective gear (hiking sandals or shoes, caps, long-sleeved shirts or rash guards) and bring water to keep hydrated. BWP’s tour rate (cove-to-cove hopping) is P1,299 (a whole day with lunch) and P1,995, if overnight. OVERNIGHT CAMPING is also an option, and it includes everything plus the campsite entrance fee, dinner, and breakfast (the next day). For island hopping inquiries, please book your tours with Mariveles Five Fingers Tour by Bataan Weather Page. Note: if you’re going solo or with only a small group, Saturdays and Sundays are open for joiner tours. You can take a 1-hour ferry from Mall of Asia Pasay sea terminal to Orion for an online pre-booked fee of P499 (check the ferry rates HERE). If your booked accommodation offers free shuttle services to the port, avail it. Either way, you can take a tricycle to the jump-off point. If you don’t mind making the long commute to Bataan, you can take a bus to Mariveles from Cubao bus terminals for less than P300. Expect to reach the town proper in about 4-6 hours, depending on traffic.